Essner Manufacturing’s machining operations has taken a giant leap forward, with the installation of 2 new Okuma MB-5000H’s. These beautiful machines are capable of cutting hard and soft metal at speeds of up to 15000 rpm. With a cutting size of 33” cubed, the machines fit perfectly into Essner’s strategy of focusing on small to medium sized parts, and cutting them quickly. “We have evolved way past the traditional set up and clamp system toward modern gripper techniques that enable the operator to set up and run in just seconds, of course while the machine is running. 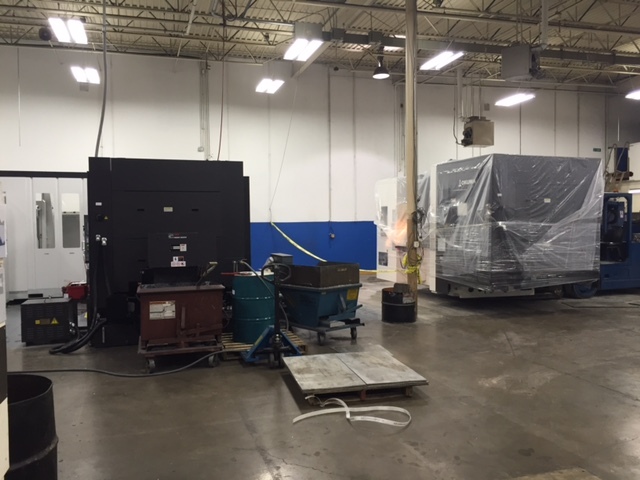 It just doesn’t get any more efficient than this” says Essner COO Dan Green. The isolation pad is in place for the third machine of the cell, which will also be attached to the pallet system, enabling even more efficient capacity to fulfill our customer needs – the third machine is scheduled to be online later this year.